For the famous leaders who were born today on August 15, it’s likely they had many responsibilities as a youngster and that is why they take their job seriously now. Just remember – the ladder to success is only as good as the people that held it steady for the climb. Admiration and respect should be mutual between their friends, family and business contacts. 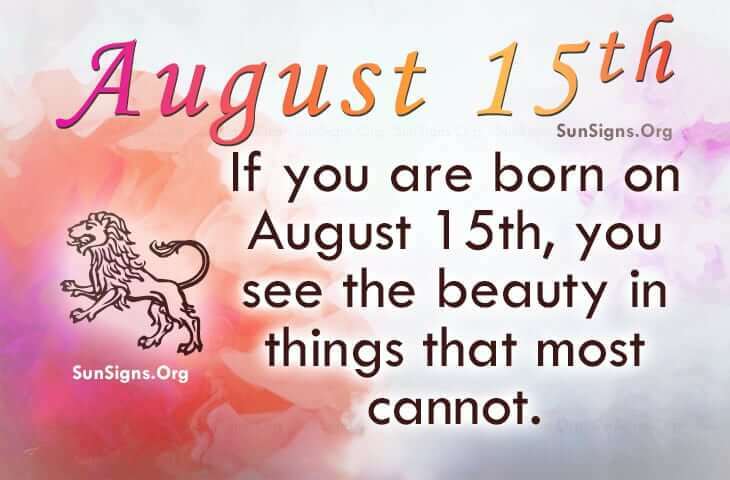 Famous people born on AUGUST 15 could be self-centered and arrogant. They want all of the attention. They are perhaps a popular Leo in spite of this little annoyance. They can’t seem to go anywhere that someone doesn’t recognize them. This could have both good and bad effects. They have the capabilities to reach the stars and they know this. It’s written all over their face, it’s in the way they walk and talk. Truth be told, they are able to see the beauty in things that most cannot. It is safe to say, money can’t buy everything. Famous celebrities born on AUGUST 15th have many who want to be their friend but they choose to have only a few who are close. They like the one-on-one attention. It’s their nature to be dramatic and this could prove to be good and bad. They have a reputation of being a great lover.